« So You Want to Remotely Manage a Computer From Another on Different Workgroups/Domains? I recently upgraded my Yoga 13 to Windows 8.1. 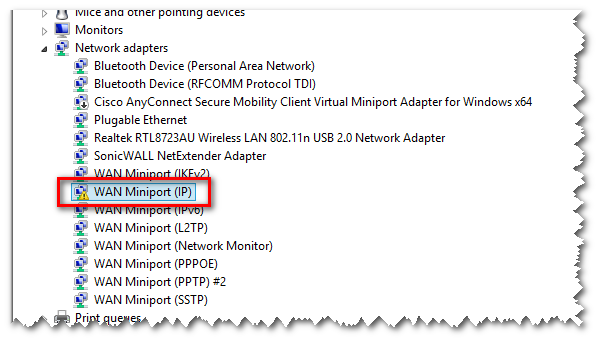 While looking around I noticed the WAN Miniport (IP) network adapter driver had a little yellow exclamation mark on it. To fix this, I found KB2871372 which appears to identify and fix the problem. I chose to “fix it myself” because I always like to get some idea of what’s going on. These are the instructions, copied and pasted, for your quick reference. Basically it appears you install the Microsoft KM-TEST Loopback Adapter and then uninstall it, scan for hardware changes and voilà, you’re done! The only problem I’ve seen with this is that it returns every once-in-a-while. Not sure why. 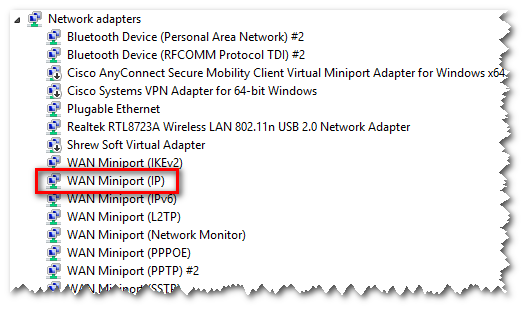 Right-click the WAN miniport (Network monitor) device, and then click Update Driver Software. Click Browse my computer for driver software. Click Let me pick from a list of device drivers on my computer. Clear the Show compatible hardware check box. In the column on the left side, select Microsoft, and in the column on the right side, select Microsoft KM-TEST Loopback Adapter. In the Update Driver Warning dialog box, click Yes to continue installing this driver. After the driver is installed, right-click the device, and then click Uninstall. After the device is uninstalled, right-click the computer name in Device Manager, and then click Scan for hardware changes. On the View menu, click Show hidden devices. The WAN Miniport (Network monitor) device should now be started and no longer have a yellow exclamation mark next to it. Of course, you can also select the Fixit button for Microsoft Fix it 20114 and let it do all the work. This entry was posted on November 11, 2013 at 4:11 pm	and is filed under Computer Repair, Networking. You can follow any responses to this entry through the RSS 2.0 feed. You can leave a response, or trackback from your own site.